the austin adventure continued bright and early saturday. no rest for these young travelers, no siree! with only a short 36 hours left on this trip, we needed to make the most of it, and we did just that. erin, shawn, kyle, kari, and i made our way over to la barbecue for what would end up being maybe the best barbecue i’ve ever had in my life. 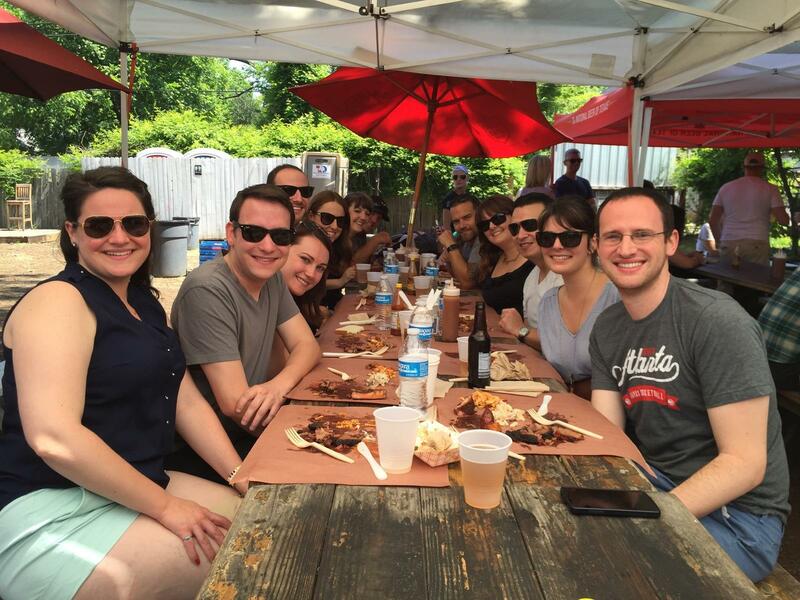 we had wanted to go to franklin barbecue, as it is probably austin’s best-known bbq joint, but waking up at 6 a.m…..on a saturday….on vacation didn’t sound like the most appealing idea. 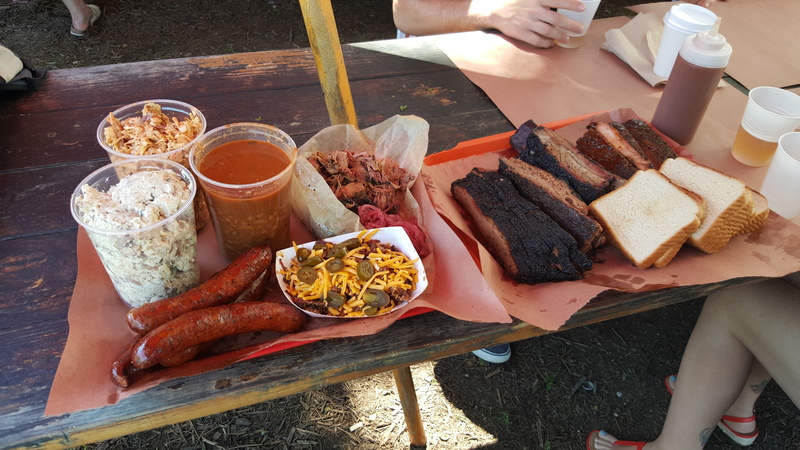 plus, our uncle craig had already given us the inside scoop that he thought la barbecue was better than franklin’s (ooooh, quite a statement to make), so we took his advice. only around since 2012, la barbecue has created quite a following for itself at the somewhat sketchy corner of east 1st street and brushy. this dirt yard hosts picnic tables under tents and umbrellas to shade you as you eat. the smoker is right there also, and you order, as you would expect, from a friendly cashier at a food truck. there wasn’t much of a crowd just yet, but as more folks started showing up, we decided we’d go ahead and create the line. we weren’t first, no, we left that to a group of younger twentysomethings that were drinking water out of previously full vodka bottles. rrriiiight. we got there about 9:30 and held down the fort as the rest of the crew arrived around 11 to hold some table space for us. when you’re traveling with 13, you’ve gotta be on top of it! 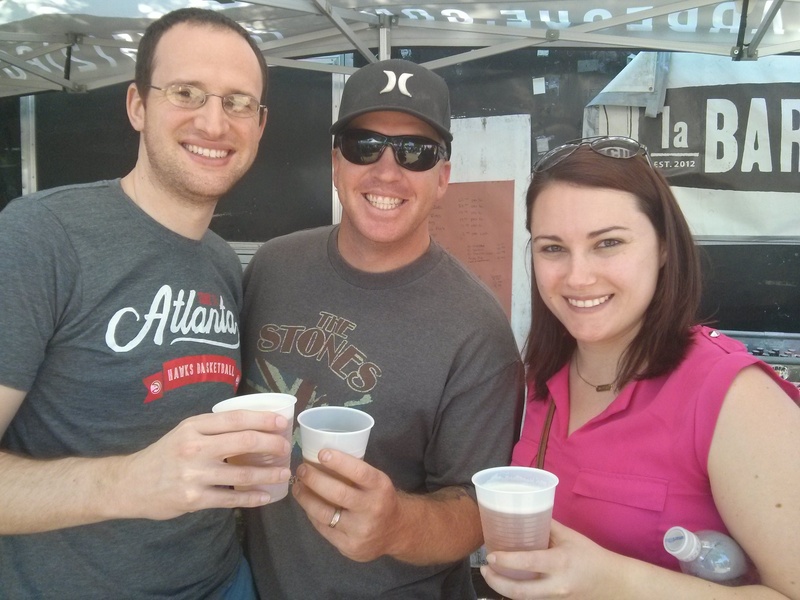 the texas morning was warming up nicely, so as we waited, we gladly took part in the free keg of beer that was being served up to the thirsty la barbecue patrons. just give ’em a tip and enjoy! there was no sense in having everyone get in line individually and order, so shawn, kyle, kari, and erin took the lead to order for the whole bunch. what did we end up with, you ask? almost a pound of everything! yes, let’s see what we had here. a quart of the potato salad, a quart of spicy cole slaw, a quart of beans, three links of spicy sausage, one frito pie, a pound of pulled pork, a few pork ribs, a pound of fatty brisket, a pound of regular brisket, and a handful of white bread because, you know, no barbecue meal is complete without good ‘ole white bread. when we were ordering, we were so kindly given a sample of the brisket. the gentleman pulled out a brand new parchment, and as he unwrapped it, a charred slab of meat peeked out between the folds. he cut off a few hunks for us to sample, and we all looked at each other with that thought “oh man, we’ve never had good brisket until this moment.” kyle took his bite and closed his eyes. he was quiet for a solid 15-20 seconds, and finally when we he finished, he opened his eyes with a smile and said something to the effect of, “i could die right now and not be unhappy.” that, ladies and gentlemen, is what should happen when people eat food. as we grabbed utensils and waters, the girls got place settings put out, and we passed the trays among everyone, one tray down one side and the other down the the opposite. they don’t have plates here, so you’ll either be eating directly off the tray or off a piece of brown parchment paper. hey, whatever works! the next hour or so was full of “mm’s” and “ooh’s” as we all got a taste of this austin staple. i can’t speak for the other end of the table (i mean, it’s a little tough to get reviews from 13 people all at once), but on our end, there were different takes on all we had eaten. we’ll start with the sides. the potato salad, from what i remember, was quite good, while the spicy coleslaw may have been a touch too spicy. i am, though, a spice wimp as many of you know, so if you, i don’t know, grew up in texas eating spicy food all your life, you’d probably be embarrassed for me. whatevs! now, let’s talk about the beans, and, just beans in general. i feel like beans get a bad rap around town because of their, ahem, after effect, but you know what? i’ll just say it, though: i like beans! i like refried beans on my tacos, i like black beans in my chipotle rice bowls, i like great northern beans in my chicken dinner, and i like baked beans in the summertime alongside some good barbecue. there, i’ve come out with it! and these baked beans at la barbecue were yummy. i liked them so much i wanted to ask for another helping but didn’t get the chance before the leftovers were chucked in the garbage. well, another time then, baked beans, another time. the summer season has just begun! now let’s talk about the important stuff, the barbecue. the spicy sausage, as you can guess, wasn’t really up my alley. it actually looked quite red when you cut into it, and i gladly let phillip eat the other half of my hunk. i really liked the pulled pork and could not get enough of the pork ribs. what we all agreed on, though, was that the brisket truly was to die for. kyle and i had excellent brisket up in salt lake city, but this stuff wasn’t just out of this world; it’s like it was in another galaxy completely. to this day (a mere 14 days after having been there), i have dreams with slabs of brisket dancing around me, hunks of it jumping into my mouth as i savor each bite. hm, did this just get weird? we cleaned up our mess and headed over to sixth street to weave in and out of the street festival tents. vendors were everywhere between guadalupe and sabine with their handmade treasures. food stands were about every other booth, and there were plenty of games and activities for the kiddos. i love a good city festival like this one. it’s a great way to get up off your couch and out of your binge-watching trance. stretch them legs! that’s what the summer weekends are for! plus, you never know what fun trinkets you might find and what memorable stories you’ll create in the process. you know i can’t resist a good black & white photo! after we made a round up and back, some cool adult beverages were calling our names, all 13 of us. “brian! clark! kate! mike! ali! shawn! erin! christian! sara! kyle! kari! phillip! kelsey!” haha, yes! it happened just like that, i swear! 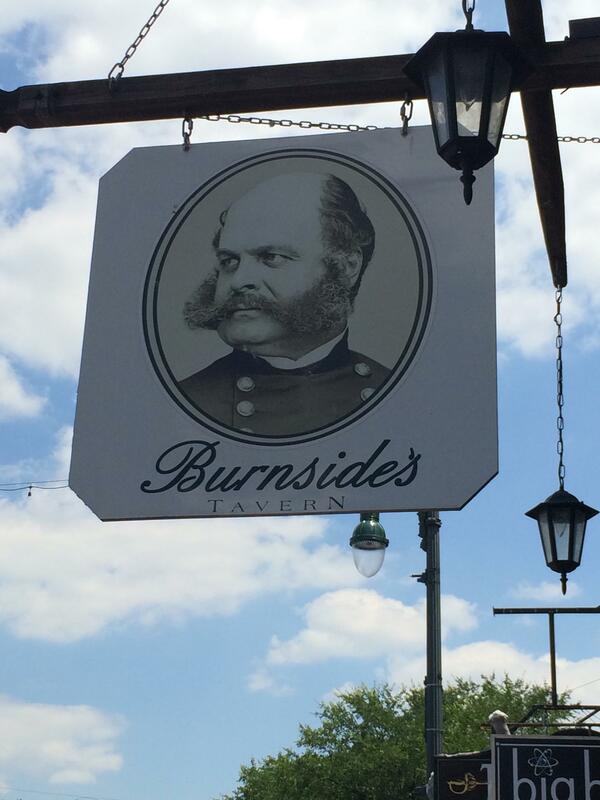 with a beckoning like that, we couldn’t refuse, so we all met up at burnside’s tavern. burnside’s is a big bar right in the heart of sixth street. here in the middle of the day was hardly anyone, a perfect setting for our big crew. some folks quickly took over the beer pong table while the rest of us snatched some stools to sit and people watch everyone passing by. phillip came back from the bar with whiskey gingers for us both, and i think it might have been the best whiskey ginger i’ve ever had in my life. made with eagle rare, the drink was so smooth and delicious that we both had another right as we finished the first ones. needless to say, we were having a great afternoon! 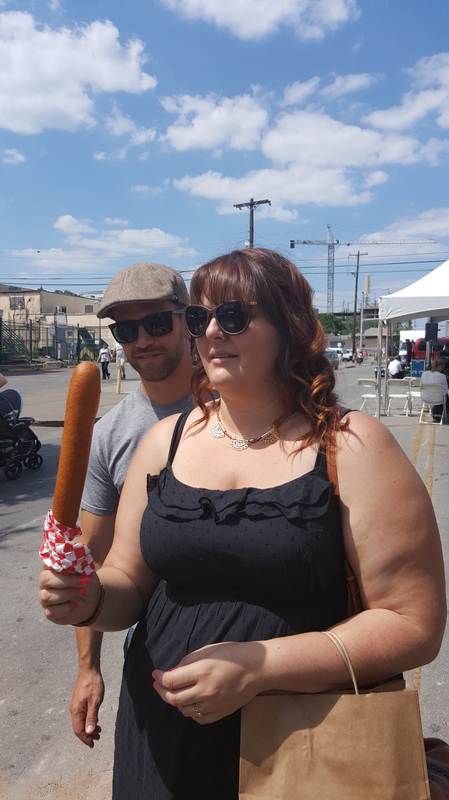 we moseyed around a little longer, and even though dinner wasn’t too far away, a few folks stopped to grab some classic carnival snacks, like this: ali ordered a footlong corndog. it was, honestly, as delicious and unhealthy as you would expect it to be. noms! everyone eventually ended up back at the house to nap, drink, and freshen up for our big family dinner. sara had perfectly orchestrated a 6:30 reservation at second bar + kitchen. we were seated at a long group of tables right near the windows, a bright spot for an early evening meal. of course plenty of drinks were ordered all around the table. i had some white wine but what was more memorable was the imperial sazerac that phillip had. the combination of rye, cognac, herbsaint peychauds, and angostura bitters was quite stiff, and after one sip, i knew it wasn’t for me. i happily left it with phillip who loved it, and wouldn’t you know that mike had one, too, and enjoyed it just as much. those two are just too cute! we hadn’t really eaten since la barbecue, and even though that was filling, we were ready to get our eat on again. we ordered the black truffle pommes frites and buffalo fried pickles to start. the pommes frites were, of course, divine. anything with black truffle and some kind of mayonnaise aioli dipping sauce is a winner. the buffalo fried pickles, on the other hand, weren’t my favorite. i liked the idea of the buffalo sauce on them, but they tasted too sauced and a little soggy. for dinner we went all-out. phillip had the seared faroe island salmon with pork belly fried rice, coconut, nam pla, zucchini, cilantro, and mint. i’ll be honest, i was quite jealous when his dish came out – just see how delicious it looks! as always, he composed a forkful for me, and it was just as tasty as it sounded. the salmon was cooked perfectly, and all those other ingredients complemented and didn’t overpower the fish. 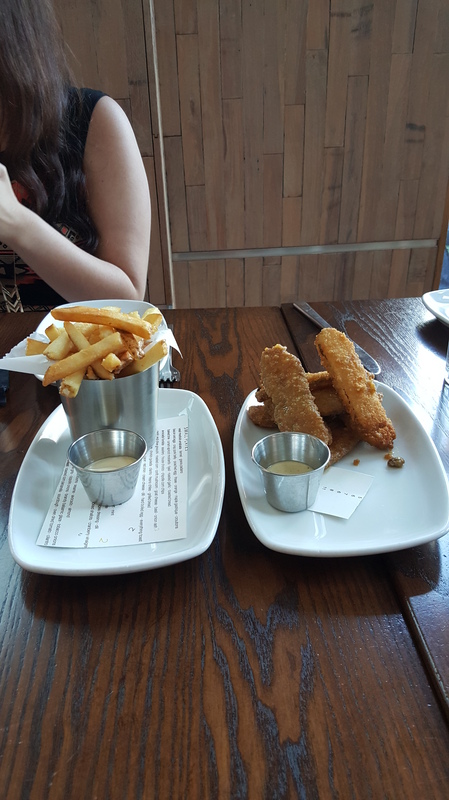 since we’d already done a little munching with the appetizers, i decided to mix it up and order a couple of small plates. i didn’t think i’d be able to do an entire entree, and i was right on target. i went with the veal meatballs arrabiata and a dish of the brussel sprouts. i first, of course, was just charmed by the presentation. isn’t it adorable?! the brussel sprouts were probably my favorite of the night, and even though they were covered in smoked bacon and feta, i’m still counting them as a vegetable! the meatballs were precious with those big skewers but didn’t spin my spurs with the flavor. nothing horrible but nothing special either. with an earlier dinner, the night was still young, so sara led us to easy tiger: bake shop & beer garden just down the street. we weren’t all in a partying or clubbing mood, so this place was perfect. we took over two large tables on their patio and visited as we drank beer, ate trail mix, and cheered folks on at the ping pong table. the weather could not have been better in the cool austin evening. they’ve got a full kitchen here at easy tiger, and next time i’m in austin, i might just come back for lunch or dinner. it’s a cool place, and i’m glad we took a chance on it. after a couple of rounds, we headed home. it wasn’t late in the night, but all the walking and day drinking along sixth street had us spent. we didn’t last very long in the living room, but it wasn’t without effort! those couches were just so comfy, and my pajamas were so soft. how could i not drift off into a heavy sleep? phillip sweetly woke me up and tucked me into bed. him though? 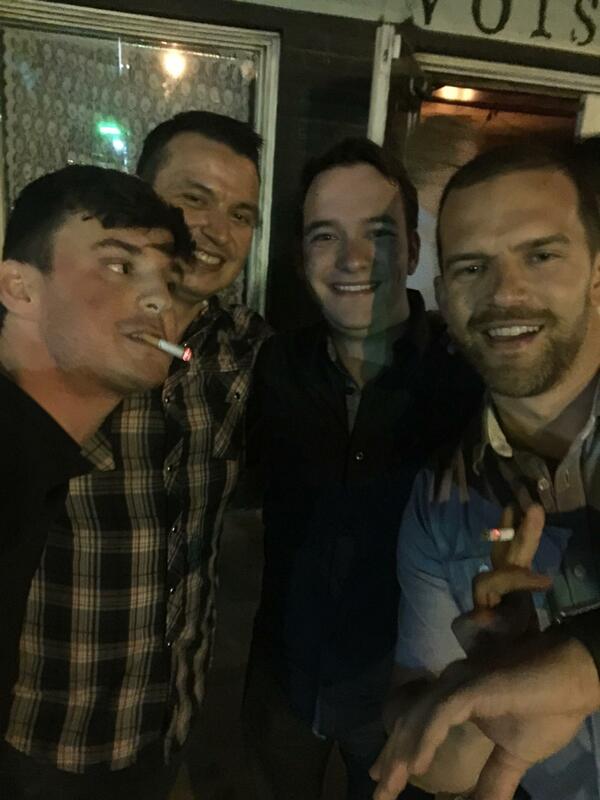 oh, he and mike went and joined brian and christian out on the town. i was later told the next morning that they stayed out until three, came home and smoked cigars for a bit, and finally hit the hay around four a.m. what came of that night was probably my favorite picture of the whole day. doesn’t it just make your heart swell? yep, it does that to me, too.